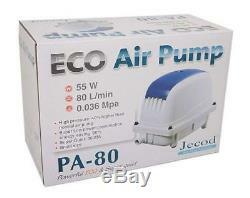 Jecod Jebao Eco Air Pump Pond Aerator PA 35 45 60 80 100 150 200 Koi Goldfish UK. Jebao Jecod 2018 PA 35 45 60 80 100 150 & 200 Litres Per Minute Air Pumps. Jebao Jecod PA Pumps have been tested and proven to provide the highest output at any given depth, to be economical to run and totally reliable to run 24/7/365, high pressure, low power consumption & super quiet for internal or external use. Jebao Jecod PA diaphragm air pumps are ideal for koi ponds, garden ponds and aquariums Features. Airpump PA35 Output: 35 liters per minute Pressure: 0.028 Mpa Power useage: 20w dBA: <32 Supplied with a 8 way nylon manifold and fittings as per the image above Voltage: 220-240v 50Hz. Airpump PA45 Output: 45 liters per minute Pressure: 0.030 Mpa Power useage: 25w dBA: <32 Supplied with a 8 way nylon manifold and fittings as per the image above Voltage: 220-240v 50Hz. Airpump PA60 Output: 60 liters per minute Pressure: 0.035 Mpa Power useage: 38w dBA: <35 Supplied with a 8 way nylon manifold and fittings as per the image above Voltage: 220-240v 50Hz. Airpump PA80 Output: 80 liters per minute Pressure: 0.036 Mpa Power useage: 55w dBA: <36 Supplied with a 8 way nylon manifold and fittings as per the image above Voltage: 220-240v 50Hz. Airpump PA100 Output: 100 liters per minute Pressure: 0.038 Mpa Power useage: 65w dBA: <38 Supplied with a 8 way nylon manifold and fittings as per the image above Voltage: 220-240v 50Hz. Airpump PA150 Output: 150 liters per minute Pressure: 0.042 Mpa Power useage: 125 dBA: <45 Supplied with a 20 way nylon manifold and fittings as per the image above Voltage: 220-240v 50Hz. Airpump PA200 Output: 200 liters per minute Pressure: 0.045 Mpa Power useage: 210w dBA: <46 Supplied with a 20 way nylon manifold and fittings as per the image above Voltage: 220-240v 50Hz. Our reputation is built on customer care and we are constantly striving to improve this aspect of our business. Our staff are fully trained to answer any questions or assist with any orders. Fast Light Limited, 2 Bessemer Park, Bessemer Road, Cranbourne Lane, Basingstoke, Hampshire, RG21 3NB. Company Registration Number: 03931735 VAT Number: 733653334. All prices shown are inclusive of VAT at the current rate. VAT invoices are supplied and enclosed with each order. If orders are received by 3.00 P. We have a very high next day success rate with our current carrier but occasionally things go wrong, please bear with us on this, as soon as we know something is not right with regard to your order we will contact you as soon as we know. The Highlands and Islands of Scotland - postcodes IV, HS, KA27-28, KW, PA20-49, PA60-78, PH17-26, PH30-44, PH49-50, ZE. Northern Ireland, Isle Of Man, and Isles of Scilly - postcodes BT, IM, TR21-25. Isle of Wight - PO30-41. Please note that we classify the Channel Islands as an international destination. The item "Jecod Jebao Eco Air Pump Pond Aerator PA 35 45 60 80 100 150 200 Koi Goldfish UK" is in sale since Tuesday, November 6, 2018. 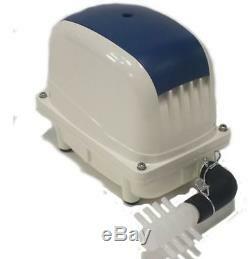 This item is in the category "Pet Supplies\Fish & Aquarium\Air Pumps". The seller is "fastlight_distributors" and is located in Basingstoke. This item can be shipped to United Kingdom, Germany, France, Italy, Spain, Austria, Belgium, Denmark, Finland, Luxembourg, Netherlands, Portugal, Sweden.